Last month, CMS assistant archery coach, Rudy Thacker was able to spend some time with Rudy Kalis. As the two Rudy’s talked, Mr. Kalis found it intriguing that the top high school archery team in the state was practicing in the cafeteria and that CMS was also the number one high school in the state, as ranked by US News and World Report. 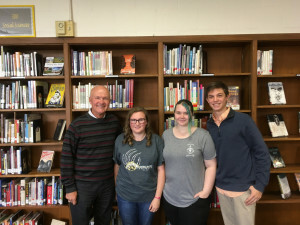 To find out more, Rudy Kalis came to Central Magnet on Wednesday to talk academics and archery with some of the top archers in the state and the nation. Meeting with Mr. Kalis was the defending high school female state champion, Alison Blanton, Kayleigh Corban, third best female archer in the state, and Connor Smathers, who tied for third at the 2017 NASP National Archery Tournament. Mr. Kalis filmed Alison and Connor shooting in the cafeteria then sat down with the three archers in the library to talk academics and archery. The footage will be used for a segment called “Real People with Rudy” that aired on 10/26/17. Click below to see the video.